Elements Applied: The commonly applied elements are closed buds. Volatile oil, the main components are the following: acetophenone, a-caryophyllene, farnesene, cineole, arcurcumene, and more. Other: phenolic acids, tannins, alkanes, gallic acid, resins, and other miscellaneous components. Used For: The remedy is potent of inducing expectoration, fighting microorganisms, and healing sores. Due to its capacity to fight infections, relieve spasms and cure inflammations, Balm of Gilead is effectively applied for laryngitis, coughs, and sore throats. The remedy is applied to cure laryngitis, associated with voice problems. Additionally applied to cure recurrent bronchitis. Its topical application is suitable for arthritis and rheumatic pains, for skin inflammations of dry origin, like eczema and psoriasis. The plant is known to stimulate the system, boost urination and treat scurvy. Tincture produced from its extract is effective in treating kidney, stomach, and chest conditions, as well as scurvy and rheumatism. Plant’s oil is applied topically for rheumatic pains, skin conditions, wounds, swellings, and bruises. 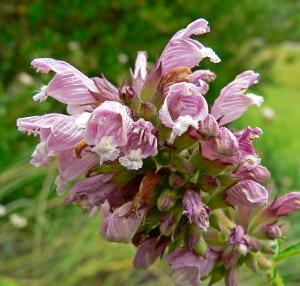 Additional Info: Balm of Gilead is specially raised in North America and Europe. Balm of Gilead may reach 100 feet in height; it’s a tall tree commonly found at the roadsides of Canada and eastern regions of the US. Leaves are green-colored at the one side, and white-colored at the other, occasionally covered with fuzz. Preparation and Intake: To make an infusion the plant is taken in a quantity of 1 teaspoon, filled up with a glass of boiling water and kept infusing for 15 minutes. The result should be consumed not less than thrice a day to take effect. In form of tincture the plant is used in a dose of 1-2 ml thrice a day. To make its taste better, apply some syrup. Commonly mixed with: Respiratory conditions are commonly cured with a combination of Coltsfoot, White Horehound, Red Sage and Balm of Gilead. Calendula and Chickweed are added to an external remedy, in order to prevent any irritations Balm of Gilead may cause.